For over 25 years, Encore guitars have been the number one starter brand.Dependable, Reliable, Playable, Affordable.If your pockets are shallow, your budget stretched but your expectations are high, join millions of others around the world who've picked and strummed their first with Encore. Playing electric guitar is the most fun you can have with your clothes on, but how do you get started? You need a guitar, for sure, but don�t want to spends loads of money at this stage. And you�ll need an amplifier � aren�t they expensive? And a lead to connect them � what�s best to get? Well what is best to get at this stage is Encore�s excellent �Play Now!� Electric Guitar Outfit. 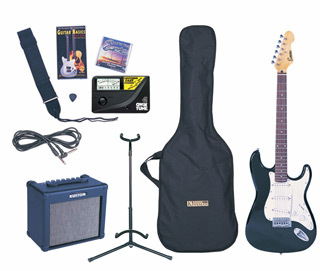 This package has the guitar, Encore�s E1BTR guitar, plus a neat practice amplifier lead and plectrum. E1BTR Guitar, EMA1 Amp, Lead, Pick, Teacher List & Instruction Leaflet.. Playing electric guitar is the most fun you can have with your clothes on, but how do you get started? You need a guitar, for sure, but don�t want to spends loads of money at this stage. And you�ll need an amplifier � aren�t they expensive? And a lead to connect them � what�s best to get? Well what is best to get at this stage is Encore�s excellent �Play Now!� Electric Guitar Outfit. 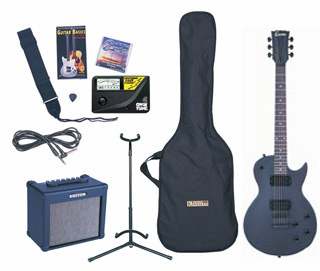 This package has the guitar, Encore�s fantastically versatile KC3, plus a neat practice amplifier and all the accessories you need to keep having fun with your electric guitar! Encore KC3 Guitar, Kustom KGA10FX Amp, JHS Guitar Stand, Lead, JHS Strap, Video, Qwik Tune Tuner, Pick, Kinsman Bag, Encore Strings Set, Teacher List & Instruction Leaflet. This popular Encore model has introduced many youngsters to the fun and excitement of playing electric guitar. Light and comfortable, the E1BTR�s downsize body makes it easy to play for kids who may not yet want to tackle bigger body instruments. Featuring a single double coil pickup, tremolo arm and straightforward volume and tone controls, the path to mastering the thrill of playing the electric guitar starts here! With a truly timeless guitar shape, Encore�s KC3 series has a great deal of guitar ability on offer. With a 5-way selector controlling three single coil pickups and a tremolo arm fitted as standard, the KC3 is a hugely versatile guitar capable of any number of music styles and sounds - rock, blues, jazz, country, funk...any or all of these will present no problems for the dynamic performance of the Encore KC3! These fantastic 3/4 size electric guitars offer all the features of their big brothers, including the full three single coil pickup layout, 5-way pickup selector, fully contoured body, shaped headstock, fully enclosed tuners, etc! Full size controls and hardware, including vibrato system, etc., and obviously accepts �normal� 1/4� size jackplug. The 3/4 size Encore electrics are in standard guitar tuning (E � E) so you can play along with their full-size brothers! We need the next generation of guitar heroes to come through soon, so get the kids playing on these fantastic junior Encore electrics, available in either pink or black. What an absolutely brilliant present for birthdays, Xmas (not long now...), or just a surprise present at a very wallet-friendly price. Playing electric guitar is the most fun you can have with your clothes on, but how do you get started? You need a guitar, for sure, but don�t want to spends loads of money at this stage. And you�ll need an amplifier � aren�t they expensive? And a lead to connect them � what�s best to get? Well what is best to get at this stage is Encore�s excellent �Play Now!� Electric Guitar Outfit. 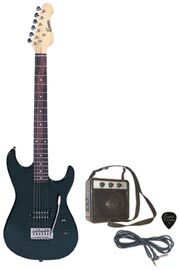 This package has the guitar, Encore�s fantastic P29, plus a neat practice amplifier and all the accessories you need to keep having fun with your electric guitar! Qwik Tune Tuner, Kinsman Bag, Teacher List & Instruction Leaflet. This popular single cutaway guitar shape offers rock solid ability, thanks to its two double coil pickups, 22 fret neck and Tune-o-matic bridge system. A 3-way pickup selector and easily-accessed 4-rotary control grouping of individual pickup volume and tone knobs provides a host of classic rock and blues guitar tones. 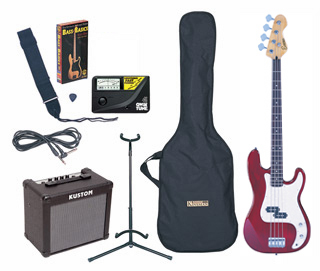 Encore PK40 Bass Guitar, Kustom KBA10 Amp, JHS Guitar Stand, JHS Strap, Video, Qwik Tune Tuner, Kinsman Bag, Teacher List & Instruction Leaflet. The ideal instrument on which to develop proper bass guitar skills. Especially so for youngsters or people with smaller hands who may not yet be able to cope with the larger finger stretches required on the daunting dimensions of a full size bass guitar. These full size, long scale beauties really are the bass business! Low enders will appreciate the timeless shape of the double cutaway bodies with their vibrant finishes, the elegant maple necks with dark rosewood fretboards, and the stylish headstock design with its four large, easily-adjusted tuners. And, with a proven centrally-mounted, split-coil double-pole pick-up powering the heavy-duty PK bass range, this versatile bass can really demonstrate that it�s truly a class performer. Also available in a black finish, left handed format at no extra cost. All products above are available from Armstrongs Guitars. Please contact us with your requirements. Any product not in stock will be obtained and shipped within a very short time.arms@ntlworld.com Please include your name, address and postcode.